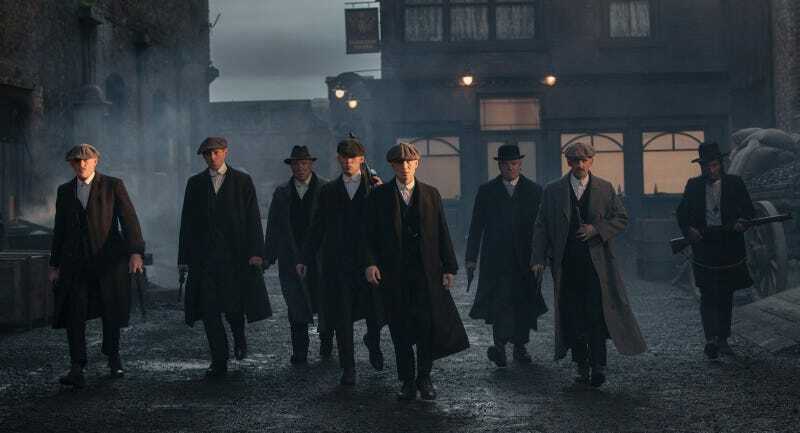 Right now, my wife is making it through both seasons of Peaky Blinders, the British TV show about warring 1920s gangs, for the second time. The big difference: This time, she's watching it with the subtitles on. She swears she'd missed entire plot threads the first time just through the sheer, distracting work of deciphering all those accents: Cillian Murphy's ice-cold guttural gulp, Sam Neill's forbidding Irish purr, the near-Bane levels of incomprehensible harrumph that Tom Hardy brings when he shows up in season two. But the accents aren't really a stumbling block—they're a crucial part of the fun. For all its explosions and face-slashings and bloody knuckles, this show remains a ridiculous blast for the linguistics alone, the kind of show that could inspire more drunk Americans to attempt bad English accents than anything since Monty Python's Flying Circus. Its two six-episode seasons are streaming on Netflix right now. You should watch them, possibly while drunk. Subtitles are optional. Peaky Blinders tells the story of a family of reprobates in Birmingham, a cold and grey shrug of a northern English city, during the historical era when everyone was dealing with undiagnosed post-World War I PTSD. Series creator Steven Knight is the screenwriter responsible for commendably nasty present-day British crime flicks like Eastern Promises and Dirty Pretty Things. (As one of the creators of Who Wants to Be a Millionaire?, the guy presumably sleeps in a Scrooge McDuck money tank and continues to crank out vicious entertainments solely out love, so bless him.) Here, he's reaching back and inventing a rich and vivid world where everyone is hatching bloody-minded plans against everyone else, all the time. In its 12 episodes of TV, the show's Shelby clan has gone up against Irish gypsies, gambling overlords, Ulster loyalists, IRA separatists, London Italian gangsters, London Jewish gangsters, each other, and, most prominently, a sneering and demonic Belfast policeman operating under the direct orders of Winston Churchill. The Peaky Blinders were a real Birmingham gang, or maybe a generalized subculture of kids who fought all the time. They got their name from the razorblades they sewed into the bills of their newsboy caps, a key character point on the show. But by most accounts, they were kids doing kid things. The principals of Peaky Blinders are something different: an organized crime family with a brilliant and ruthless leader, fighting to lock down a British criminal empire. This is one of those Sons of Anarchy-style shows where the vast body count strains all credulity and where the scheming hoodlums seem too smart to be real. But as grimy fantasy, it's one of the most straight-up addictive shows I've seen in ages. A lot of that comes down to straight-up movie-star charisma. It's been a while since Cillian Murphy's weirdly defined facial features and dead-fish presence have lit up movie screens, the way they did when he was dodging scrambling zombies in 28 Days Later or throwing on the Scarecrow mask in Batman Begins. But as Tommy Shelby, the calculating leader of the show's central clan, he's got all the otherworldly authority he brought to movies like Sunshine or Red Eye. As his main antagonist, the unscrupulous super-cop Chester Campbell, Sam Neill is even better: good enough that you wonder just how underrated his long career might be. Campbell is a great villain: utterly without empathy, convinced of the righteousness of his crusade, blind to his own hypocrisies. Neill plays him with the same uprightness he brought to Dead Calm or even Jurassic Park, adding a gleefully malevolent streak that hides just beneath the surface most of the time. When it's time to do something raw, though, Neill stops just short of twirling his impressive mustache. This isn't one of our current great TV shows. Poignant as the WWI aftereffects can be, the constant bloodletting here doesn't represent much of anything: It just is what it is. You also get that weird thing where the main characters always seem like they're about to die, but then somehow miraculously pull through. Boardwalk Empire comparisons are inevitable thanks to the '20s-criminal-underworld setting, and you don't get that show's sweep here, though I'd argue that these characters are a hell of a lot more compelling. Sons of Anarchy parallels are even more inescapable, and when Sons star Tommy Flanagan (the Scottish guy with the scars) shows up late in season one as a long-lost Shelby family member, it's a bit on the nose. Still, Peaky Blinders is a show that finds a cartoon dizziness in its brutality, one that absolutely delights in the gangster-movie cliches it trots out. In just 12 hours of TV, it's built up a rich and vicious universe, one where you can count on at least one ecstatic fight or shootout per episode. In the dead of winter, when even HBO isn't bothering to throw anything much on TV that isn't Girls, it might just get you through.